BOOK NOTES: "A Universe From Nothing"
8: Hubble later showed that, based on Cepheid variables in Andromeda – that it was not part of the Milky Way. 9: 1665 Newton noted colored lines from the white light of sunlight; in 1868 noted the yellow part of the sun’s spectrum yielded lines not known to be associated with Earth elements – calling it helium. Near the turn of the century, helium was first isolated on Earth. 11. 1929, via observations at Mount Wilson observatory, Hubble used red shifted lines Hubble determined that the further away the galaxy is, the higher is its recession velocity. Galaxies 2x further than others recede at 2x the rate, etc. 15. They calculated 500km/sec/million-parsecs where a parsec = 3 light-years) which would equate to a universe of about 1.5 billion years old. 17. Supernova used as “standard candles” yields extrapolation that at 1 second old, the universe was compressed to a plasma of about 10 billion degrees Kelvin at which nuclear reactions proceed until expansion stops those reactions by adiabatic cooling. 18. During the nucleogenesis period H could fuse to Deuterium, Helium, and to Lithium, but no further along the periodic table. We now find 25% of protons and neutrons by mass exist as Helium, while 1 in every 10 billion neutrons and protons exists as lithium. 19. During the history of our galaxy, about 200 million stars have exploded. 1990s type 1a supernova discovered to be brighter and to shine longer – excellent “standard candles.” By using type 1a supernova to determine distance and redshift to determine recessional speed – the expansion of the universe can be calculated. 20-21: “making a tiny circle between your thumb and forefinger about the size of a dime… hold it up to a dark patch of the sky where there are no visible stars. In that dark patch, with a large enough telescope … you could discern perhaps 100,000 galaxies, each containing billions of stars… you should expect to see, on average, about 3 stars explode on a given night (at once per 100 years per galaxy) [1016 stars in that view]. Modern instruments have thus been able to determine a more accurate Hubble number of about 70 km/sec/million-parsecs yielding the current estimate for the age of the universe as about 13.72 billion years. 24: Vera Rubin in the early 1970s measured the rotation of the Milky Way – consistent with it being associated with much more mass than that which is luminous. 28: Milky Way within the Virgo supercluster whose center is almost 60 million light-years away. 31: Caltech astronomer Fritz Zwicky in 1933 analyzed relative motions of galaxies within the Coma cluster and found that they should have flown apart – pointing to dark matter. 32: Gravitational lensing of distant quasars by intervening galaxies in 1987 and 1998. 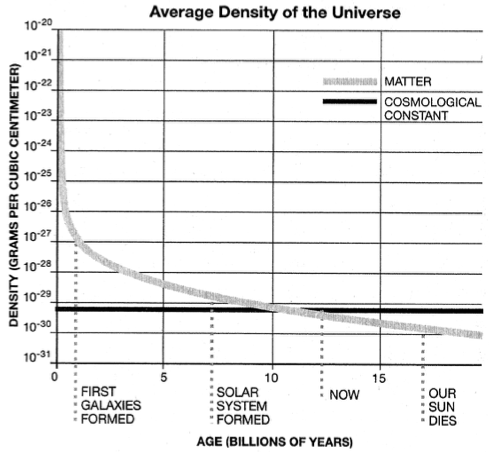 34: graph of matter density relates to galaxy location in distant cluster yields fact that most of the mass of the cluster lies between the galaxies – dark matter. The calculated amount of this matter results in an omega = 1, flat universe, and indicates that there is more than 100 times as much dark matter as visible. 42-43: CMB discovered 1963 by Penzius and Wilson with Wilkerson group at Princeton building an antenna at the time to find the predicted photons of the last scattering surface from the universe at 380,000 years of age when temperature = 3000 degrees Kelvin at which point neutral hydrogen could form and photon mean path increased to allow transparency. 44-48: universe has expanded by a factor of ~1000 since CMB era yielding temperature of that black-body radiation now at ~2.7K. “If one considers a distance spanning about 1 degree on the last scattering surface as seen by an observer on Earth, this would correspond to a distance on that surface of about 300,000 light-years. Now, since the last scattering surface reflects a time when the universe itself was about 300,000 years old, … means no signal from one location could travel across this surface at that time by more than about 300,000 light-years.” “Now consider a lump of matter smaller than 300,000 light-years across. Such a lump will have begun to collapse due to its own gravity. But a lump larger than 300,000 light-years across won’t even begin to collapse, because it doesn’t yet even “know” it is a lump. Gravity, which itself propagates at the speed of light, cannot have traveled across the full length of the lump.” “This singles out a special triangle, with one side 300,000 light-years across and the other sides the distance of the CMB surface from us – equals about 1 degree. Thus, the largest lumps of matter which will have begun to collapse will span that angular scale if the universe is flat. That has been found exactly via BOOMERANG (1997), WMAP (2001), and Planck (2010?). 57-58: Dark matter plus baryonic matter yields about 30% of that needed to flatten the universe. Einstein’s cosmological term equals completely empty space having the equivalent of mass. 58-63: Quantum mechanics was developed between 1912-1927 through Danish physicist Niels Bohr, Austrian physicist Erwin Schrödinger, and German physicist Werner Heisenberg based in part on Max Planck’s 1905 proposed quantum of action. Bohr’s quantization rules were ad hoc, but Schrödinger and Heisenberg derived those rules from first principles where electron particles “spread out over space” as a “wave function.” Dirac showed that those laws could be derived through analogy with the dynamics of classical objects. He worked to try making quantum mechanics consistent with Einstein’s General Relativity. In 1929 discovered that if he modified the Schrödinger equation into matrices (set of four different coupled equations) he could consistently unify quantum mechanics with relativity with respect to electrons – and thereby predicted the existence of positrons. A positron moving backward in time is exactly equivalent to an electron moving forward in time (first visualized by Feynman). 64-69: Virtual particle pairs come and go in space interacting with non-virtual particles for very short intervals. In April, 1947, American experimentalist Willis Lamb and his student Robert C. Retherford discovered a way to visualize and measure the fine structure of hydrogen’s spectrum and thereby test Dirac’s equation. The results were not exactly as predicted resulting in a few years of work by several theorists leading to the realization that the experimental findings agreed with Dirac’s equation exactly when virtual particles were considered. (With a virtual positron and electron produced – the electron will drift toward the proton nuclear area while the virtual electron will drift outward beyond the orbital electron which will shift the charge distribution and thus energy levels seen at any given instant of observation. Accounting for this effect, the prediction matches the experiment within 1 part in 105. Using the same techniques, atomic parameters can be calculated with a precision of better than 1 part in 109. It can be shown that virtual particles are responsible for MOST OF THE MEASURED MASS WE OBSERVE. Nucleons consisting of 3 quarks actually also contain virtual particles and fields that convey the strong force between quarks. 70-73: A nucleon’s rest mass thus primarily consists of virtual particle pairs constituting the strong force between the quark constituents. Extending this logic to empty space using Heisenberg’s Uncertainty Principle and other quantum mechanical rules – the calculated virtual mass/energy of the universe is wildly inaccurate by a factor of ~10120! This unsolved puzzle is known as the Cosmological Constant Problem as defined by Russian Cosmologist Yakov Zel’dovich ~1967. 78-79: Measuring a Type 1a supernova’s brightening period then accounting for time dilation due to the universe’s expansion yielded the actual time of brightening in its rest-frame, which is shorter than measured in our relative motion frame. Then comparing that data to galactic red-shift data yielded a more accurate measure of the universe’s expansion rate. 80-86: “In 1996, I was spending six weeks visiting Lawrence Berkeley Laboratory, lecturing on cosmology and discussing various science projects with my colleagues there. I gave a talk about our claim that empty space might have energy, and afterward, Saul Perlmutter, a young physicist who was working on detecting distant supernovae, came up to me and said, ‘We will prove you wrong!’“ [This was referring to the Krauss’ suggestion that the universe was flat with 70% of the energy contained in empty space] Perlmutter’s group “Supernova Cosmology Project” produced their initial work in 1998 incorrectly suggesting that the universe was slowing in its rate of expansion. Another team, “High-Z Supernova Search Team” lead by Brian Schmidt at Mount Stromlo Observatory in Australia obtained different results – suggesting an accelerating expansion thus pointing to a significant vacuum energy their request for additional telescope time was declined based on Perlmutter’s results that the universe was flat – dominated by matter. Six months later Perlmutter’s group announced similar results in agreement with Schmidt’s team. The Nobel was later awarded to Saul Perlmutter, and to both Brian Schmidt and Adam G. Riess of the “High-Z” team. The data fits a universe with 30% of the energy in matter and 70% of the energy within empty space. Note that on Page 78, the 1998 BOOMERANG experiment coincidentally demonstrated that the universe is flat. 87: Age of the universe now known to four significant figures = 13.72 billion years old. 96-98: Inflation: a microscopic sized region of false-vacuum space initially began expanding. As it did, the initial false-vacuum energy contained was distributed within an expanding volume – eventually allowing for that energy to move to more stable structures of lower energy content – a phase transition. In the early phase of that transition, the false-vacuum “latent heat” functioned as an energy that permeated all space acting as a repulsive force that caused an ever more rapid expansion of space – allowing it to grow faster than the speed of light – by a factor exceeding 1028 all occurring within a fraction of a second. During the inflationary period quantum fluctuations results in differing regions to stop inflating at slightly different times, each with slightly differing densities of matter and energy. The variation in densities seen within the CMB exactly agrees with those obtained using quantum mechanics calculations. Those quantum fluctuations being frozen by the phase transition allowed for the distribution of matter and energy we see today. 99-103: All the matter and energy we observe can be considered positive in energy content whereas the gravitation field can be considered to contain negative energy in the same region. The two add to zero (sum of kinetic energy and potential energy is a constant). The universe appears by all measures to be flat – thus the sum of these two energies must be precisely zero, indicating that the phase transition driving inflation divided nothing into positive something and negative something – still totaling nothing! 106-108: “our observable universe is at the threshold of expanding faster than the speed of light.” … “Galaxies that we can now see will one day in the future be receding away from us at faster-than-light speed, which means that they will become invisible to us.” … “light from these objects gets ever more redshifted. Eventually, all their visible light moves to infrared, microwave, radio wave, and so on, until the wavelength of light they emit ends up becoming larger than the size of the visible universe, at which point they become officially invisible.” This will not include our local cluster of galaxies as these are gravitationally bound. “Galaxies just outside our group are about 1/5000th the distance out to the point where the recession velocity of objects approaches the speed of light. It will take them about 150 billion years, or about 10 times the current age of the universe, to get there, at which point all the light from the stars within the galaxies will have redshifted by a factor of about 5000. By about 2 trillion years, their light will have redshifted by an amount that will make their wavelength equal to the size of the visible universe, and the rest of the universe will literally have disappeared.” Observers in the far future would see what observers in 1915 saw – a single galaxy (our coalesced local group) containing their star and planet and nothing more. Evidence of spacial expansion, dark energy, etc. would be unobservable. 109-110: We live in the only universal era allowing these mechanisms to be observed. If we lived 5 billion years ago or earlier – there would be no evidence of dark energy as at those times the universe was matter and radiation dominated with a slowing expansion. When the universe grows to about 50 times its present age, the CMB wavelength will have elongated and those frequencies will be below the local group’s expected plasma frequency at which time all CMB photons will be completely scattered – making them impossible to detect. 113: “At the present time only about 15 percent or so of all the observed helium in the universe could have been produced by stars in the time since the Big Bang…” In the far future, this will not be true as stars continue to burn hydrogen to helium, etc. In about 1 trillion years 60% of the visible matter in the universe will be helium thus blurring any attempts to determine the age of the universe. One possible explanation is that the cosmological constant we find in this universe was “anthropically” selected… we could only live in a universe with this specific cc value. 130-134: String theory – initially required 26 dimensions to allow consistency between General Relativity and Quantum Mechanics Theory. Edward Witten introduced the idea of “supersymmetry” allowing for consistency with 10 dimensions + time with a collapse of 6 of the spacial dimensions into the extended 3+1-dimensional space we experience. Further analysis has indicated that “branes” underlie strings and that compactification of non-spatially extended dimensions yield as many as 10500 possible universes – each with individual sets of physical laws. 136-138: Anthropic or from first principles: Why are there three generations of leptons and quarks, why is gravity so much weaker than the other forces, why is the proton ~2000 times heavier than the electron? Will physics become an “environmental science” – where the fundamental constants of nature are randomly (accidently) selected? 154-155: “…virtual photons that have essential zero energy, can propagate across the universe without disappearing, and the field due to the superposition of many of them is so real it can be felt.” Example: two charged plates brought close together in a vacuum causing virtual pairs of electrons-positrons to pop out of the vacuum and move toward the oppositely charged plates, reducing the charge on each plate. “In so doing, it is possible that the reduction in energy arising from reducing the net charge on each of the plates and hence the electric field between them can be greater than the energy associated with the rest mass energy required to produce two real particles. Hawking realized that gravity could offer such a field – allowing black holes to seemingly radiate particles (virtual pair production near the event horizon with one falling in, the other not – hence the equivalent of black hole radiation – lessening the gravitational field/mass of the system. 157-158: There are 109 photons per proton. “The CMB photons are the remnants of the early matter-antimatter annihilations near the beginning of time.” Current thinking is that quantum statistical fluctuations could drive such an asymmetry on the order of 109. 162-163: “…all that ultimately determines the behavior of systems are geometric quantities like curvature.” … “…no completely unambiguous method to define Feynman’s sum-over-paths technique in general relativity.” … “… a quantum theory of gravity allows for the creation, albeit perhaps momentarily, of space itself where none existed before. 167-170: “…in a closed universe, … the total positive energy, including that associated with the rest masses of particles, must be exactly compensated for by a negative gravitational energy, so that the total energy is precisely zero.” [analogous to a positive poll with field lines extending out will be balanced by a negative poll where the lines meet and there can generate another particle which collapses the field.] Universes must pop in and out of nothingness and be completely self-contained space-times, disconnected from our’s. … “The characteristic lifetime of tiny closed universes will therefore be microscopic, perhaps on the order of the ‘Planck time,’ the characteristic scale over which quantum gravitational processes should operate, about 10-44 seconds or so.” … “If before such a universe can collapse, the configuration of fields within it produces a period of inflation, then even an initially tiny closed universe can rapidly, exponentially expand, becoming closer and closer to an infinitely large flat universe during this period. After one hundred or so doubling times of such inflation, the universe will be so close to flat that it could easily last much longer than our universe has been around without collapsing.” Thus, “Nothing” is unstable! 175: Multiverse – a possibly infinite set of distinct and causally separated universes with laws of physics that are accidents and in our universe, those correlated accidents allow for our existence and our questions [Anthropic argument] via eternal inflation.